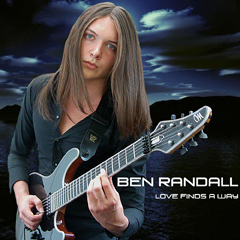 Ben Randall took up the guitar around the age of 14, and immediately realised the future was in his hands. It took a few more years for the wider world to wake up to his guitar talents. In 2008, defying the laws of guitar-dom and only just 17, he won the ‘Most Promising Guitarist’ prize in the first ‘Guitar Idol’ an internet-based competition that attracted over 750 entrants. Since this time he has gathered a loyal following of devotees via the Internet and, for a period, whilst in the power metal band Power Quest. During this time the band supported Michael Schenker and Tarja Turunen. Ben continues to develop his music and his latest track marks something of a departure from his usual melodic metal style: it’s a more accessible piece with a great groove, demands repeat plays, and is sure to further establish his reputation as a guitar hero in the making.